All Teacher Editions (TE) are reproducible. The TE contains an answer key, an answer key by category, and the Item Analysis section that can be used as an instructional tool after the Benchmark. Student Editions (SE) are sold as consumables with a minimum order of 10 books. The SE contains the two benchmarks, four CBAs, answer forms, and a STAAR Chart for progress monitoring. 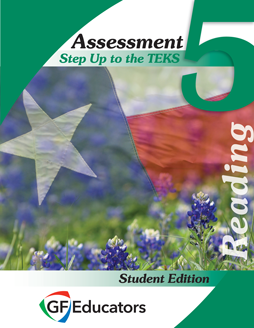 View a Sample of the 5th Reading Assessment Student Edition by sending an email to info@stepupteks.com asking for the password. Accompanies the 5th Reading Assessment Teacher Edition.